December 7, 2012 - Bombardier Aerospace announced that Delta Air Lines has placed a firm order for 40 CRJ900 NextGen regional jets and has taken options on an additional 30 CRJ900 NextGen aircraft. Based on the list price of the CRJ900 NextGen aircraft, the firm order is valued at approximately $1.85 billion US, and could reach approximately $3.29 billion US if the 30 options are converted to firm orders. The new CRJ900 NextGen regional jets will be configured with 76 seats in a two-class cabin and will be operated by Delta Connection carriers to be determined by Delta Air Lines. "We selected Bombardier's CRJ900 NextGen aircraft specifically because it is proven to be the most cost-efficient jet aircraft in its class for our operations and this regional jet satisfies perfectly the agreement that we have made with our pilots to add 70 more 76-seat jetliners to our fleet," said Ed Bastian, President, Delta Air Lines. 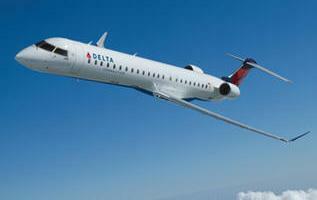 "We have selected the CRJ aircraft for our restructuring plan based on the strength and reliability of their performance with our Delta Connection carriers over the years." Delta Connection carriers currently fly 466 CRJ Series aircraft − 286 CRJ200, 79 CRJ700 and 101 CRJ900 jetliners − making it the world's largest CRJ aircraft fleet. The CRJ900 airliners in the Delta Connection fleet include 57 flown by Pinnacle Airlines, 16 by ExpressJet Airlines and 28 by SkyWest Airlines. "Building on a relationship that is 20 years strong, we are delighted that Delta - one of the world's largest, most prestigious global airlines - continues to select Bombardier CRJ regional jets to replenish its fleet," said Mike Arcamone, President, Bombardier Commercial Aircraft. "CRJ aircraft have been in service with Delta Connection carriers since 1993 when Comair became the first North American airline to operate the CRJ100 regional jet. Since then, Delta has been a steady Bombardier CRJ customer and has been a major contributor to the worldwide success of the CRJ aircraft program. We look forward to a continuing strong relationship with Delta and we have every confidence in our ability to provide innovative solutions to meet the airline's business requirements." Including the order from Delta Air Lines announced today, Bombardier has recorded firm orders for 1,775 CRJ Series aircraft, including 314 CRJ900 and CRJ900 NextGen aircraft. Worldwide, CRJ Series aircraft are in service with more than 60 airlines and more than 30 customers operate corporate variants of the aircraft. The aircraft are operating in over 50 countries on six continents, and on average, a CRJ aircraft takes off every ten seconds somewhere in the world. CRJ Series aircraft have transported more than 1.2 billion passengers and have logged more than 34 million flight hours and over 28 million takeoffs and landings.